Latakia Port is run by the coalition of the French CMA CGM, a worldwide leading container shipping group and Terminal Link, an offshoot of CMA CGM, and Syria Holding Company. Latakia (locally known as Al Ladhiqiyah) is located approx 40km south of the Turkish border and is Syria's principal port. The traffic handled by the port is diversified and facilities exist to accommodate tankers, Ro-Ros, container ships, general cargo and bulk vessels. Approximately 3,000,000 tons of cargo is handled annually. The main channel for the Port of Lattakia is 3166 meters long and 14.5 meters deep, and the port covers 150 hectares of land and 135 hectares of water surface, and it contains 23 piers with a total length of 4280 meters with alongside depths from 3.5 to 13.3 meters. The port has 9 cranes and 33 locomotive engines with metal ways of 34 KM Length, and slipway of 900 tons capacity. The Port of Lattakia has ample handling and storage capacity. Its grain silos can accommodate 35 thousand tons, and it has a refrigeration warehouse with capacity for 1500 tons of cargo. The Port of Lattakia contains 14 open yards covering a total area of 50 hectares, and it offers 23 closed stores with total area of 12.8 hectares. Handling area for general cargoes covers about 185 thousand square meters, and the container terminal covers 430 thousand square meters with capacity for from 15 to 17 thousand containers. The Ports has an electric station, passenger stations for passengers and customs and security transaction and an infirmary. Today, the Port of Latakia is undergoing a modernization program to improve the port's performance by adding updated equipment, streamlining work processes, and training port personnel in the latest cargo-handling and port management practices. The project includes building new silos and rehabilitating old ones, expanding the port through a three-phased process, establish a new maritime training center, and secure container-management services. The Port of Tartous lies on Syria's western shores on the Mediterranean Sea about 80 kilometers by land south of the Port of Lattakia. 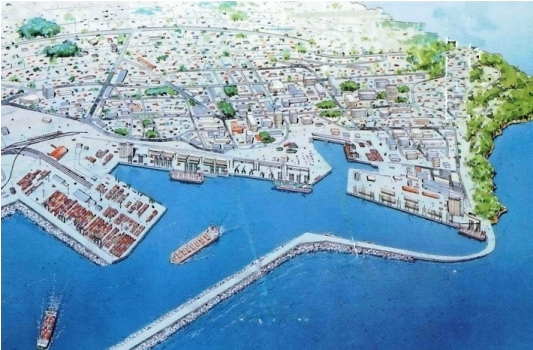 The Port of Tartous is one of Syria’s two major ports.